Several years ago the KVIS Businesses and Commercial Properties Committee identified the need for a village grocery store. In order for the store to fit into the architectural scale of the village, the committee knew that the store would need to have a small footprint compared to big box stores. They began to look for a store that would fulfill that requirement as well as having other qualities like low prices, selection of organic foods, and could be a place that would become a destination location. The committees national search for such a store made it clear that Trader Joe’s would be the best choice for Kenmore so we devised and started a two year campaign to bring the store here. We set out knowing that ultimately, should we attract Trader Joe’s to our area, that they may not choose Kenmore. There were many aspects to our campaign but the main part featured a life-sized promotional figure (LSPF) called Kenmore Joe. Joe was made by KVIS members and traveled throughout Kenmore and WNY having video and photos taken of him that were then posted and presented in various ways. The campaign had Joe so busy at one point that he had to have a Manager, Nanci DeMeo. Although this was her first time managing the activities of an LSPF, Nanci treated Joe as any other client, even though he required being carried to each appointment and needed assistance when standing! Carrying Joe wasn't an easy feat because he is a big guy - 6’ tall with a 44 inch waist. Ultimately we learned that in part due to our efforts, a Trader Joe’s store would be opening –not in Kenmore but very close to our community. Although we were disappointed to not have the store come here, we were excited to have helped bring them to our WNY community. After they announced their location we continued to help raise awareness and build anticipation for the grand opening. Kenmore Joe had always said that he would be the first customer in the door when our Trader Joe’s store opened and he was! 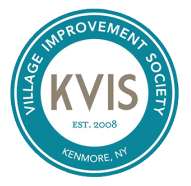 Although the focus of KVIS is primarily on Kenmore, we know and value the fact that we are connected to the communities around us. We do not work in an isolated bubble, and realize the importance of the multiple messages we strive to continually share –that Kenmore is a family friendly place be and that our Buffalo and Western New York area is an engaging and progressive place where retail stores that are considered to be hip and enlightened like Trader Joe’s and Whole Foods belong. We are pleased to have been a part of attracting Trader Joe’s and hope that their success here is continually noticed by other quality retailers and businesses of all kinds. The Shredd and Ragan Show asked KVIS President, Melissa Foster to be on their popular radio show to ask questions about the KVIS campaign to bring a Trader Joe’s to Western New York. The KVIS had just sent out a press release saying that we were ending our campaign because we had learned that a Trader Joe’s store was indeed opening here. During the interview it became clear that the radio hosts didn’t believe that store was coming and Melissa was asked, “You believe so much that the store will be coming here –would you bet twenty dollars on that?” The answer from our KVIS President was, “Absolutely –I’d bet a hundred!” Once the store opened, the KVIS sent a letter to the Shredd and Regan Show reminding them of the wager. Soon afterward we received this letter from Tom Ragan. Where is Kenmore Joe Now? Since the store opened Kenmore Joe has kept active. He was a part of the KVIS lead initiative for Kenmore to be named an All-America City. Kenmore was named as one of 24 finalists for the Award and Kenmore Joe traveled with the group that went to Denver to make our presentation. As expected, Joe was very popular in Denver, almost everyone at the Finals wanted to have their photos taken with him! What’s ahead for him now? He’s considering his options but hasn’t made any firm commitments at this time.